I think today's card is a good one because it's kind of bleak and blustery outside my window today. This card reminds me of Spring that really can't be too far away especially if my allergies are any indication! It uses the great new SAB set, Polka Dot Punches. I really love this set because it does coordinate with so many of my Stampin' Up! punches. I'm off to go work on a sample for my next class. It will be a great Spring Themed Envelope Scrapbook. Have a great Saturday everyone! oooh! Great card Sharon. I love the way you used the new boarder punch on it too. Oh, it IS bright and springy! I needed that! Love the way you layered the flower punches to look like leaves! 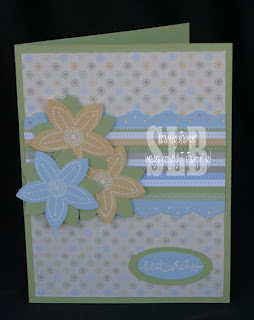 This is a fabulous card Sharon - a great way to show off the SAB sets! !